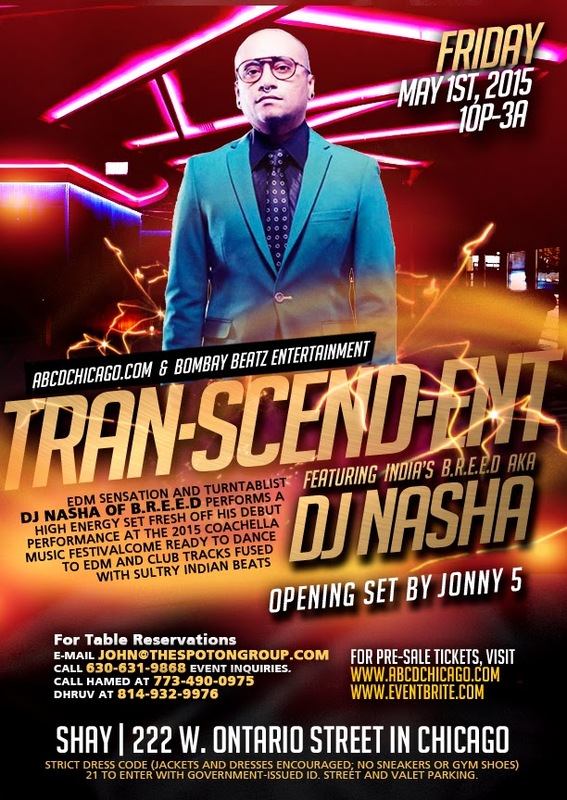 ABCDchicago: tran•scend•ent | featuring DJ Nasha of B.R.E.E.D | 2015 Coachelle artist! tran•scend•ent | featuring DJ Nasha of B.R.E.E.D | 2015 Coachelle artist! EDM sensation and turntablist, DJ NASHA of B.R.E.E.D performs a high energy set fresh off his debut performance at the 2015 Coachella Music Festival ! Come ready to dance to Commercial EDM and Club tracks fused with sultry Indian beats. Opening set by Naveen Kumar. Strict dress code (jackets and dresses encouraged; no sneakers or gym shoes). 21 to enter with government-issued ID. Street and valet parking. About Artist: DJ NASHA has performed at several internationally-acclaimed music festivals like Burning Man, (USA), Sunburn (Goa), Global Groove (USA) and most recently, Coachella (April 2015). He is a 2-time winner of the World DMC DJ Championship, India and currently on tour to launch B.R.E.E.D.’s new EP "Incu-Bass".